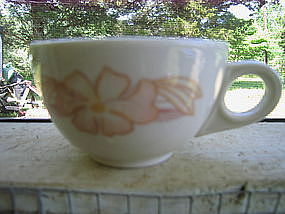 Vintage restaurant sugar bowl marked as Homer Laughlin China, Lead Free, USA LLD. There is no damage. I need your zip code to calculate the postage. There is no damage. I need your zip code to calculate the postage. 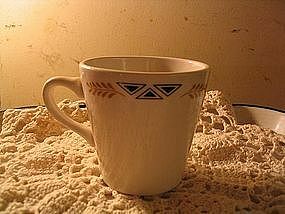 Plain white 8+ ounce cup/mug backstamped Homer Laughlin Best China. They do not have a date code, but they were bought with matching plates coded O-A. No chips, cracks, breaks or rough rim. Very little sign of use. Several cups as well as plates are available for purchase. I need your zip code to calculate the postage. 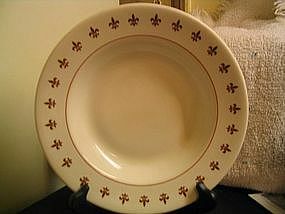 All white 10 inch dinner plate dated code O-A (I think that would be 1974). No chips, cracks, breaks or rough rims. A few light utensil marks. 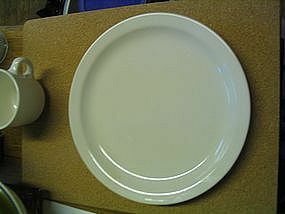 Several plates in like condition available and priced individually. Matching cups for sale. I need your zip code to calculate the postage. I am not sure of the official pattern name. 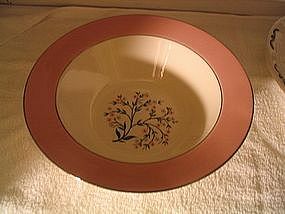 It suppose it would be considered a rimmed soup bowl and measures close to 9 inches across. It is coded 95-L. No chips, cracks, breaks or rough areas. There are some utensil marks, but no paint loss. Detailed photos by email. I need your zip code to calculate the postage. 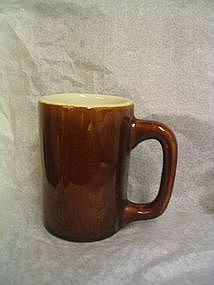 Heavy 8 ounce mug with white interior and brown exterior. No date codes on the bottom - just the Hall China backstamp. No chips, cracks, breaks or rough rims. 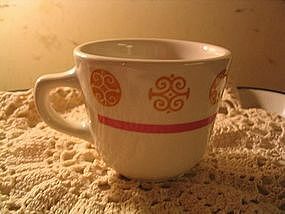 It does have some small superficial scratches on the exterior - the spots on the mug in the photo is glare. Additional photos by email. I need your zip code to calculate the postage. 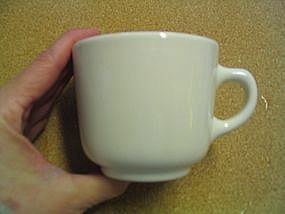 Individual size which holds 14 ounces. Marked as Hall China 2323. I've used off and on for several years, but has no chips, cracks, breaks, rough rim, crazing or finish damage. I need your zip code to calculate the postage. There seems to only be a number for this particular pattern. 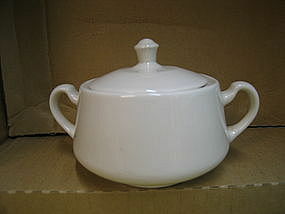 The gravy boat has a chip on the bottom rim as well as minor wear. Detailed photos of all areas of wear by email. I need your zip code to calculate the postage. 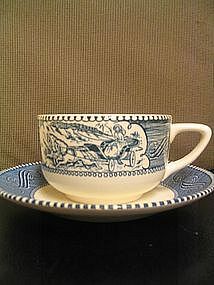 Cup and saucer with no chips, cracks, breaks or rough edges. The finish is without damage. 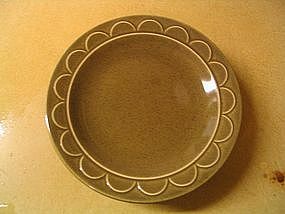 4 additional saucers area available for sale priced at $2.00 each and they are without damage. I need your zip code to calculate the postage. T.S.T. Genuine Oven-Serve Ware U.S.A. incised on the bottom. Measures approximately 2 inches in height. No chips, cracks, breaks or roughness. I need your zip code to calculate the postage. Manufactured by Canonsburg. 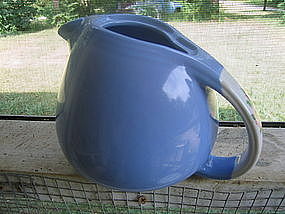 Measures 13 3/4 inches. No chips, cracks or breaks. Light utensil wear as well as some manufacturing flaws. 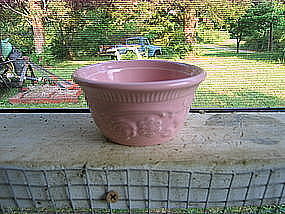 Berry bowls also available for purchase. Additional photos available upon request. I need your zip code to calculate the postage. 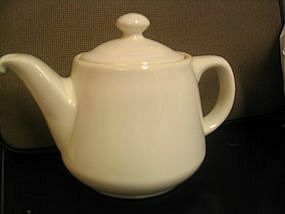 Manufactured by Homer Laughlin and distributed by Coventry. Original stoppers. No damage - the little white spot is glare. 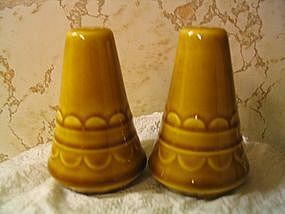 2 cups are available in this pattern. I need your zip code to calculate the postage. 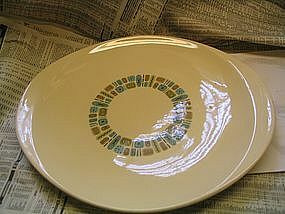 Round 8 1/2 inch serving bowl by Homer Laughlin in Eggshell Nautilus. There does not seem to be a formal name for this pattern. It is similar to several other HL patterns, but for identifying purposes it is marked as N1642 in gold. It is also date backstamped as A 42 N 5. 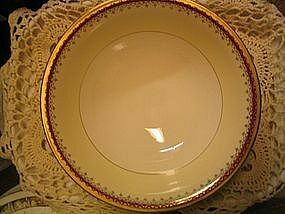 There are no chips, cracks or breaks, but has minor wear to the gold trim as well as light utensil wear. I will be happy to provide more detailed photos upon request. I need your zip code to calculate the postage. Black triangles and laurels Best China backstamped VC llll. 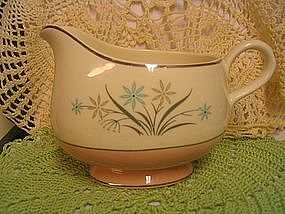 I can't find an official name for this pattern. No crack, chips or breaks, manufacturing flaws. I need your zip code to calculate the postage. Best China backstamped TB l. No chips, cracks or breaks. 2 cups are available and priced individually. I need your zip code to calculate the postage.